Dead2Red videos – regular and HD! Looking at China’s technological expertise firsthand during our week in Shanghai is simultaneously awe-inspiring and unnerving. We know that we’re in China’s most expensive city, which arguably pushes tech even further than it might be in other parts of the country, but even with that in mind, I sometimes felt like it will take the USA ages to catch up with things that the Chinese take for granted – or possibly, we’ll never catch up at all. More on that below. Google search is gone. Gmail seems, weirdly, to allow mail to be sent (sometimes) but not to be received. Facebook and its sub-companies (instagram and whatsapp) are all wiped out. But hey, you’ve got Skype and the Chinese-hosted version of Bing Search! Christine, who didn’t have a VPN on her phone, has gotten very used to searching with Bing now. It’s just as terrible of a search engine in Chinese as it is in English. I came equipped with two VPNs on my phone – my work one, and a personal one running off my home router. The former is IPSec Xauth, and the latter is PPTP (yes I know it’s old and insecure! I just needed it to see if it could circumvent the Great Firewall!) – the IPSec one worked almost always and could connect very quickly, the PPTP one worked most of the time (some wifi routers seemed to block it without exception) and could connect a bit slower. So my analysis is that as of January 2019, the GF is not completely blocking all PPTP connections, as some websites have posited. The blocks are, as I expected, for commercial VPN companies that are publishing their VPN addresses online for the Chinese government to scoop up and block, not for the entire PPTP protocol. While it would be trivial for the GF to block all PPTP traffic (it uses well known and easily blockable protocols) the Chinese government is now very pro-capitalist and very pro-money. Corporations might not be using PPTP very much anymore (and they sure the heck shouldn’t be, as it can be decrypted within a day) but the Chinese government doesn’t want to run the risk of scaring away companies and their valuable tax revenue by blocking corporate VPN traffic – they seem to only want to block commercial ones. Okay, enough arcane tech jargon. What isn’t blocked by the GF? Wechat. 100% Wechat. I remember 5-10 years ago China also used a chat client called QQ (and my AFS brother Daniel still uses an email address with the wonderfully short qq.com domain name (I love me a short email domain!)) but now in 2019, any other GF-approved companies have been washed away by the dominating flood of Wechat. Every person uses it, and every company uses it. QR codes. Relegated to an amusing nerd “wouldn’t it be cool if we used these?” oddity in the USA, China has grabbed the ball and run with them so far that there’s essential no way we could ever catch up. Beyond the usual “chat client” functionality of Wechat that we Americans can understand and use ourselves, the other 75% of wechat is how it uses QR codes. If you give Wechat the ability to access your smartphone camera (and let’s face it, most do) then you can enter its “scanner” mode, and aim it at a QR code. Every billboard for every company, large or small, will stick at least 1-2 QR codes on it that you can scan to “follow” that company’s news postings. This is how Wechat is not only a chat system, but also a twitter-esque social media system with a “newsfeed” of public postings by your friends, official company handles, and internal groups – just like how we use them. But let’s take restaurants. Sure, they have a wechat handle you can follow. Sure, even a noodle cart will let you pay for your meal by displaying your personal wechat QR code, which is linked to your bank account or credit card, and payment takes less than 5 seconds, your phone vibrates and a notification pops up that “15 yuen has been deducted”. But in four different larger restaurants we went to, even each individual table had its own, personal QR code that you could scan with your phone, immediately be linked to not just a menu, but a full ordering system where you could have any item on the menu, sent directly to your table. Interaction with waiters is essentially null at places like these. We went to a karaoke house with Daniel, his wife Valerie, and his dad Steven. 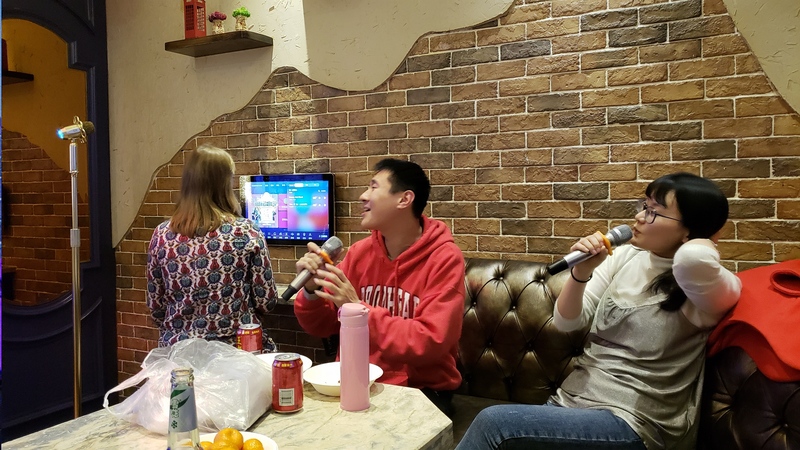 When most Americans think Karaoke, we think of a Bar format, where there’s usually a DJ, a book of songs he has, and you come up with pieces of paper and give them to him, and he keeps track of what order people give them to him. Then you have to wait your turn, put up with people who aren’t your friends singing terribly, and all that jazz. The Chinese would laugh at us if they saw this. Their karaoke setup is worlds ahead of ours – for $20, our party of 5 got a private room with three microphones, a TV on each wall showing music videos with lyrics overlaid, and a control screen where you can modify the volume of the backing audio, the main vocals track (if you need help singing, for example), and choose the next song out of an internet-connected list of thousands. But of course, you can also aim your phone at a QR code and be automatically connected to the control system for your specific room and do everything from there. Amazing. Christine works with the control screen instead of using her phone – foreigner problems! China is a big country, with a lot of people. You probably knew that. The Chinese market does not suffer foreigners, because they don’t need to. In every other country I’ve been to, English-speakers are generally catered to, especially in their largest cities. China is like, make versions of our QR code sites in English? Make English versions of their Google-replacements, like Amaps for Navigation, and DaZhong DianPing for reviewing and rating places? Nah, they don’t – and because the country is nowhere near internet saturation like the USA and much of Europe are, gaining new Chinese speakers all the time, they don’t need to care about translating their apps for non-Chinese speakers. It was frustrating, but I don’t blame them. Unfortunately it means that Google Maps, even with my completely functional VPNs, is basically useless. You can’t add or edit locations on Google Maps, and there’s almost no businesses and stores on there anyway, since you’d only be able to access the system with a VPN anyway. A vicious cycle that pulls users away from the Western made sites and into the Chinese made ones, that allow complete Party access to their systems to make sure that no one is doing anything that will, in the words of the Party, destabilize “social harmony” in their creepy dystopian way. At least I can understand why the Party blocks Google services, with all of its scary destabilizing elements. What makes less sense to me is why it blocks foreigners from engaging in the Wechat QR code cashless economy. National governments, particularly nosy totalitarian ones, like trackable electronic payments. When you can dig into your entire population’s buying habits and see exactly where, what, and when they’re buying, you can feel powerful and in charge. By contrast, cash has serial numbers on it, sure, but beyond fraud and forgery, it’s a lot harder to track for day to day spending. Yet Christine and I aren’t able to add any credit cards to our Wechat accounts, or bank accounts, debit cards, or Paypal. We thought perhaps we could have Daniel transfer us some digital yuen to us, but it turns out that you can’t even use the payment functionality of Wechat without putting in a National Chinese ID Card number, a Chinese phone number, and a Chinese debit/credit card or bank account. Sure, I was lucky that Daniel trusted me enough to loan me all three of those things on my phone, but is the average foreigner visiting China going to get a random stranger to do all that to their phone? Of course not. Once he did all of that for me, he was then able to transfer me money, to which I’d hand him a wad of cash. Then everything worked fine. Christine on a bike that Valerie unlocked for her. 1 yuen (about 15 cents) per hour! Once you can pay for things with digital yuen and QR codes, the amount of weird services you can buy is limitless. Need to rent an umbrella while coming out of the metro on a rainy day? 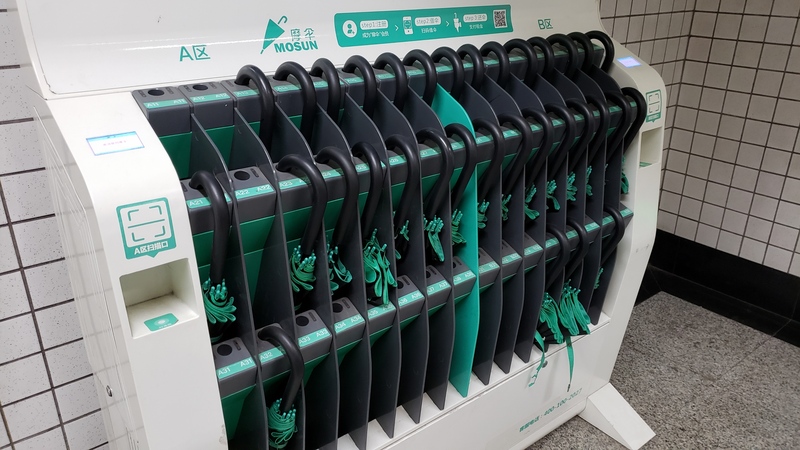 There’s a company that’s built a machine for that, which unlocks an umbrella after you scan a QR code and charges you a few yuen. In the mall and need an external battery to charge your phone as you roam? A company’s built a machine for that. 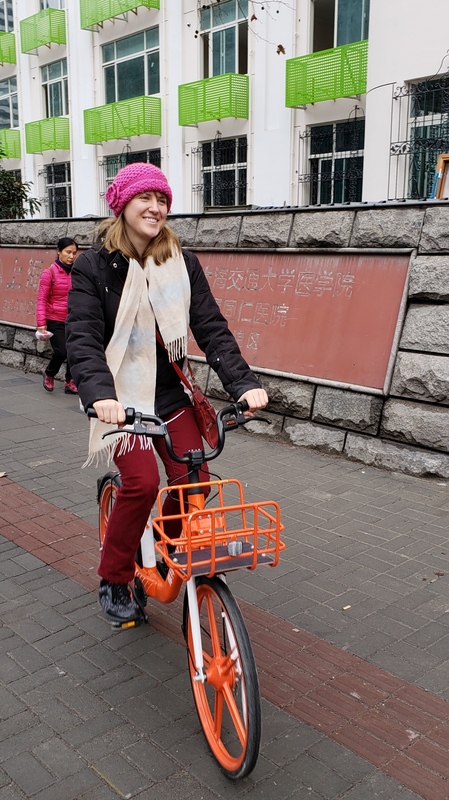 Not to mention at least a half dozen different bike-sharing companies have unleashed tens of thousands of QR-code unlockable bicycles throughout the city, all GPS equipped. Within Wechat, you can “follow” (like Twitter) those companies, which allows a “mini-program” running within Wechat (similar to how apps like Candy Crush run within Facebook) to run, showing you a map of every available bicycle that company owns near you. Assuming you’ve allowed Wechat to access your GPS which of course, most Chinese people have. More metadata for the Party to have on you! (not to mention your phone’s microphone and every picture you’ve ever taken). 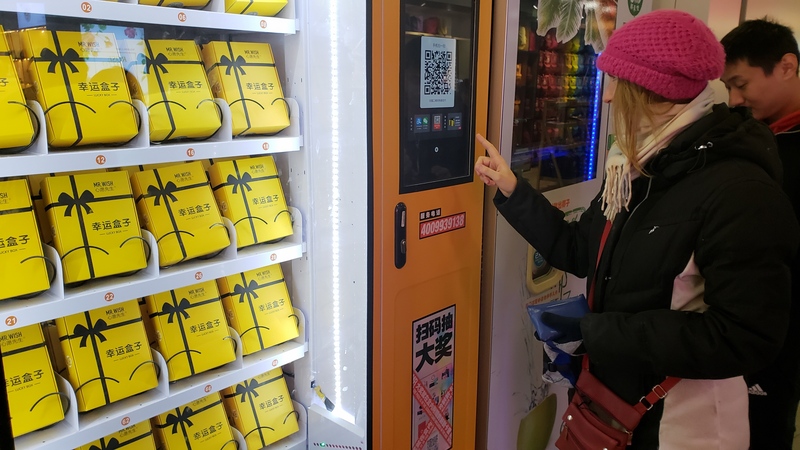 And certainly it’s not even worth mentioning the vending machines – we’re used to vending machines in the States, after all – that all accept scanning their own QR codes, to let you buy any item inside them. 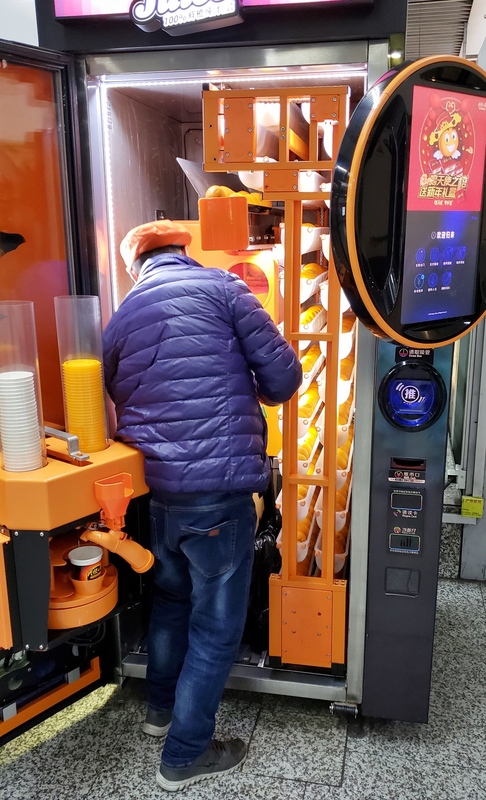 As an aside, they’ve also taken their vending machine tech to levels far beyond ours, with fresh squeezed orange juice coming from rows of neatly stacked oranges, to sandwich construction, and cup noodle preparation. The USA is just starting to reach that level of automation in the prep areas of high-end restaurants, not even close to how the Chinese have put these rugged machines out for public usage in metro stations. So… could the USA replicate any of these successes? Or does our headstrong independence work against us in this regard? I’m inclined to think so. For one, with the exception of iPhone users being herded into using iMessage by Apple’s default options, the majority of Americans are still using SMS for communication. The rest of the world (outside China with Wechat) is using Whatsapp. Within my group of friends, we usually use Google Hangouts. The majority of Americans probably (although I have no stats to back this up) use Facebook for messaging these days. I made the argument to Christine that if any company was in a position to become the Wechat of the rest of the world, it would be, unfortunately, Facebook. They have the social aspect. They have the 1 to 1 messaging and group messaging part. They will happily take your credit card information and store it for you. They just don’t have the QR code function part. So, to prevent fragmentation, we’d have to become a lot more used to QR codes, and we’d have to calm down and nationally “settle” on a unified chat platform. I just don’t see the USA doing that anytime soon; if we didn’t join our fellow Western nations on Whatsapp in the past decade, then we’re certainly not going to follow the Chinese bandwagon out of the blue. So for now, we’ll have to settle for being impressed – and a bit uncomfortable – with the high levels of tech in China. I hope to someday visit Japan and see how they do this, without the authoritarian government backing! I kept reading PPTP as peepee teepee, which is apparently a needed accessory for changing diapers. I tried adding the VPN server to Christine’s iPhone and made the nasty discovery that yet again, Apple decides to make choices for its customers instead of letting them make their own decisions. No wonder Apple seems to be gaining influence in China (2018-Q4 financial report aside) – they’re both big brother organizations.